1 Spray a large saucepan with lowcalorie cooking spray and place over a medium-high heat. Add the onion, celery, peppers and a splash of water. Cook for 5 minutes to soften, adding more water if it gets dry. 2 Add the squash, paprika, cumin and cider vinegar, and crumble over the stock cube. Pour in 1.2 litres boiling water and bring to a simmer. Cover and cook for 15 minutes, or until the squash is tender. 3 Use a stick blender to purée until smooth, then loosen with a little extra water if too thick and season to taste. Mix the fromage frais with 100ml water. 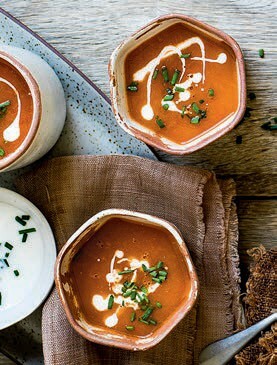 Divide the soup between 6 mugs or bowls, drizzle over the fromage frais and scatter with a few chives. 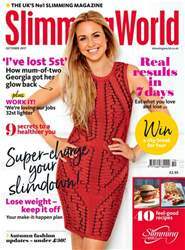 Super-charge your slimdown with the October issue of Slimming World magazine! See results in just 7 days with our make-it-happen eating plan; meet 10 real-life slimmers who between them have lost an amazing 79st; and serve up your favourite pub grub from our low-Syn menu board. Plus discover how to build your own support squad, change your weight-loss destiny and get moving with walking sports. Download your issue now and make it an awesome autumn!